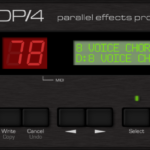 The effects produced by this unit can rival those of much costlier devices (often found in professional studios). This is because the Roland SRV-330 uses 16-bit, 44.1kHz digital processing, and was designed as a result of painstaking efforts directed at redefining and redeveloping all the essential features that a professional-quality, dedicated reverb should have. The Roland SRV-330 provides newly developed algorithms which can deliver effects that are quite revolutionary-including a ’three-dimensional’ reverb which has its early reflections localized in a multiple number of positions in space. New effects such as this are possible thanks to the technological expertise accumulated through Roland’s development of the RSS (Roland Sound Space) system. With every stereo algorithm, the internal processing of the left and right channels in the Roland SRV-330 is done independently. This assures that every detail of spatial localisation contained in the input signals is retained even after effects have been applied. The Roland SRV-330 produces a high-density reverb that you normally wouldn’t expect from a device in this price range. The unit contains many essential reverb-related algorithms that are actually borrowed from the Roland R-880, but altered somewhat to make them easier to use. The effects you obtain from the Roland SRV-330 can easily and conveniently be altered while a performance takes place. Either pedals, or MIDI messages can be used to control specified parameters.